These Spicy Salmon tacos are super easy to put together and taste incredible. Made with juicy salmon fillets, corn, shredded cabbage and drizzled with a tangy and creamy avocado lime dressing or topped with avocado slices. It’s been a few years now since Cody and I went on our Mexico trip, and I’m having MAJOR beach bum withdrawals! What I would do to go back and just lay on the beach every day, soaking up the sun, listening to the waves. I’m thinking a beach trip is definitely in order soon! In light of those dreams, I’ve recreated what we ate almost every day in Mexico: Fish Tacos! Specifically, Spicy Salmon Tacos with Avocado Lime Dressing! Watch this Spicy Salmon Tacos w/ Avocado Lime Dressing video! Ok, and moment of honesty. Like real life blog life honesty. 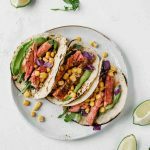 I’ve made these delicious Spicy Salmon Tacos with my 3 Ingredient Creamy Avocado Lime Dressing about a million times and can vouch for how amazing they are! HOWEVER…I blanked when I photographed these and FORGOT THE AVOCADO LIME DRESSING. What. I know. How. It’s even in the title of this post. I instead just added slices of avocado! 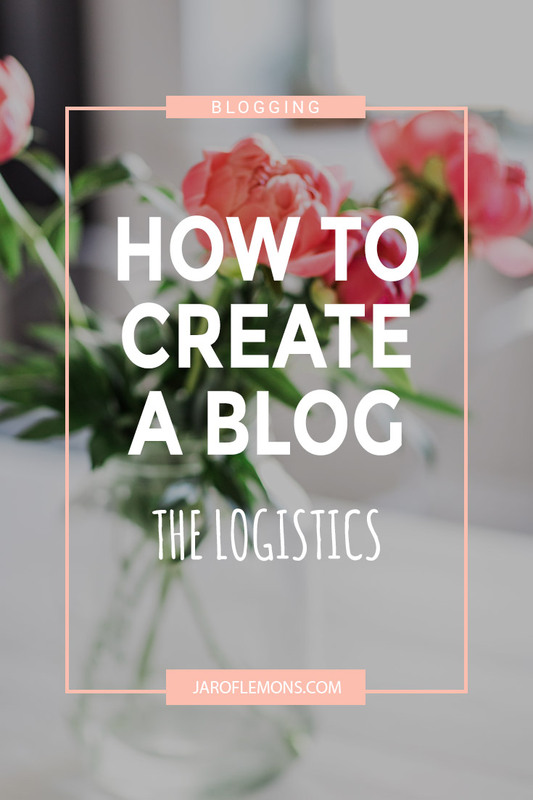 I know, major blogging fail. However, they were still amazing with avocado slices! All this to say: feel free to make these your own. 😉 Whether you go with the avocado lime dressing or stick to simple slices of avocado, I think you’ll really love this recipe, friend! In this case, I used salmon because it’s super nutritious and one of my favorites. If you don’t like salmon, (first of all WHAAAAA???) feel free to use a different type of fish. A meaty white fish, bones removed or trout would work well. I used a mix of corn, shredded cabbage, romaine lettuce, beans, and avocado. I love this mix and balance of flavors and textures but you can use whatever you have at home or throw in you favorite veggies. These tacos are super easy to adapt with what you have! I used paprika and chili powder which gives a nice spicy kick to the tacos. You could also use cumin, red pepper flakes, oregano or even some fresh chili to turn up the heat! A squeeze of lemon or lime juice always adds a kick of zingy flavor too. I love these delicious Organic Corn Tortillas and it’s what I use in this recipe, they are naturally gluten free which is an added bonus and taste great. Flour tortillas would also work. I used my avocado lime dressing which works perfectly and is super easy to make but you could also top with some sour cream, salsa or hot sauce. These Spicy Salmon tacos are super easy to put together and taste incredible. Made with juicy salmon fillets, corn, shredded cabbage and drizzled with a tangy and creamy avocado lime dressing. Mix the paprika, chili powder, salt, and pepper in a small bowl. Rub the spices over the salmon filets and bake for 10-15 minutes if filet is thawed or 20-30 minutes if cooking from frozen (until the fish is flaky). While the salmon is baking, create the 3 Ingredient Creamy Avocado Lime Dressing with water instead of yogurt (to thin it out) and only use half of the avocado. Cut the other half of the avocado into cubes. When salmon has finished baking, top 4 tortillas with lettuce, cabbage, beans, corn, salmon, and drizzle with the avocado lime dressing. ALSO: as it turns out (and if you couldn’t already tell), I’m a little bit obsessed with comfort food recipes that also happen to be healthy. 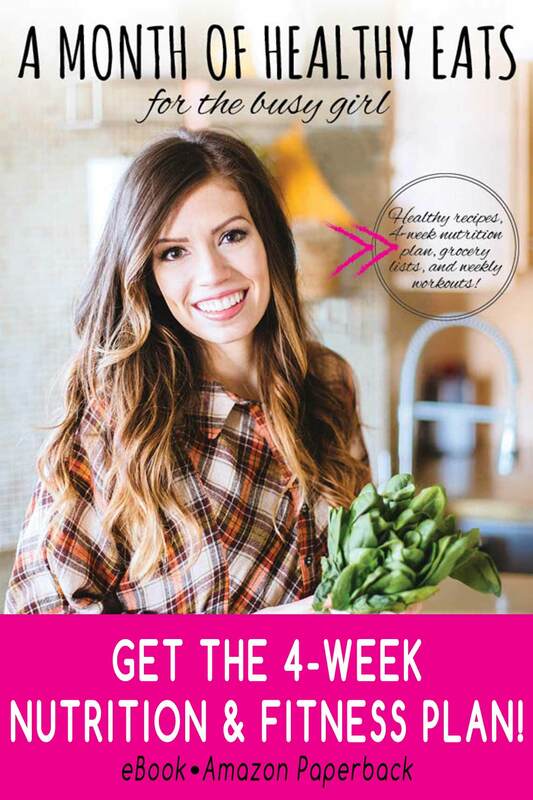 If you are too, then be sure to check out A Month Of Healthy Eats For The Busy Girl! There are tons of healthy and easy recipes in this new book, including tacos, pizza and overnight oats. 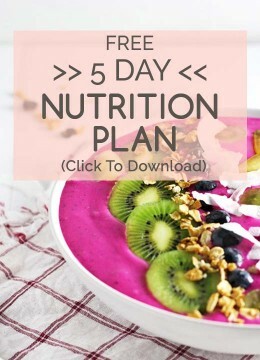 It also includes a meal plan and grocery lists to make life easier! Head over to the shop page and grab your copy, friend! Well Christine…thank you so much for sharing this crazy good salmon taco recipe like none other! I use recipes from all over the world to cook and then use my husband to taste test! Some recipes are keepers and some…welp get tossed back where they came from for others to enjoy! This was a definite keeper! How refreshing and a great alternative to our bbqed on cedar plank salmon recipe that we’ve mastered! Another salmon recipe we use is a blend of panko and bread crumbs then pan fry it, yum! So those were our two salmon go to recipes and now… thanks to you lovely lady, we’ve got one more! Hooray for the internet and the ability to share recipes across the country! So glad you enjoyed the recipe, Catherine! I’m so excited to hear that this one’s a keeper! 🙂 YAY! I always love black beans, but any should be fine! Could I use salmon packets if I don’t have fillets available? These look amazing! I can’t wait to make them. Oh my God! If I don’t eat this for dinner I will die hahaha. Looks delicious!! Sure I’ll try it. Hahaha! That’s awesome, Melanie. Enjoy the recipe!